On November 13, the Rothman Institute Ice Rink at Dilworth Park opens for its second season on the west side of City Hall! This year, the rink has expanded hours, special events, promotions and the opportunity to learn to ice skate! Open daily through February 28, 2016, admission is $3 for children ages 10 and under and $5 for adults. Skate rental is $9. Plus, the new Rothman Cabin will be steps away from the rink with tasty food and drink from Garces Events, featuring everything from Cuban burgers and fries to hot chocolate. 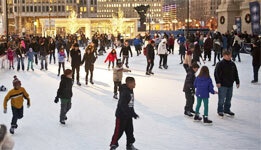 It's going to be another great season of skating and fun, right in the heart of Center City! The Rothman Institute Ice Rink is sponsored by Rothman Institute, PNC Bank, 6abc, and Temple University Center City. Visit DilworthPark.org/rothmanicerink for special hours, events, rental information, and more. This year, LAGOS is proud to partner with Philabundance during their much-anticipated jewelry sample sale, November 6-7 and 13-14. Philabundance is the region’s largest hunger relief organization, providing emergency food and access to three quarters of a million people at risk of hunger and food insecurity in the Delaware Valley. LAGOS will donate a portion of the proceeds from this year's sample sale to them. Come out for jewelry at 50% off retail and support Philabundance. Visit the circus, tickle the ivories and become a kid again by visiting the world of Albert Schoenhut’s toys at the Philadelphia History Museum. Exhibition highlights include the Humpty Dumpty Circus, rarely-seen dolls and an interactive piano. Open now through December 31. MANNA's Pie in the Sky 2015 has officially begun! With every pie you buy, MANNA prepares and delivers seven nourishing meals to someone battling a life threatening illness such as cancer, HIV/AIDS, cardiac disease, and more. This year, MANNA is excited to offer American Airlines Sky Pie and Aberdeen Apple Pie. You can feel good about doing good. The Prime Rib, known for its steak and seafood, is currently accepting reservations for Thanksgiving. In addition to the regular menu, they’re offering roasted turkey, butternut squash soup, whipped sweet potatoes and pumpkin pie. Photographer Dave Heath began his life more than 80 years ago right here in Philadelphia, and has come full circle with an in-depth exhibition at the Philadelphia Museum of Art. Multitude, Solitude: The Photographs of Dave Heath runs through February 21, 2016, and marks the very first time all of the images from Heath’s lauded book A Dialogue with Solitude are displayed together in a museum within the United States. The exhibition covers Heath’s work from the 1940s through the 1960s, and follows his whereabouts — beginning in Philadelphia, traversing the country and serving in Korea as a part of the U.S. Army, and later moving to New York City before settling in Toronto.